I visited a record fair today, hunting for new old vinyl. The fair was not spectacular (mainly Dutch dealers and a few lost Germans and one Englishman), but I managed to get some nice rarities anyway. A weird one is this one: plucked from the bargain bin, the French entry for the 1985 Eurovision Song Contest. 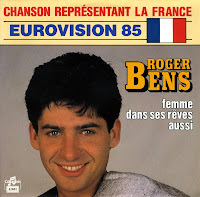 France was represented by young Roger Bens who sang 'Femme dans ses rêves aussi'. I can honestly say that I didn't have a clue what this song was like. I have seen it a couple of times during my life (since I own the 1985 Eurovision on dvd) but it's passed me by completely. When you hear the single you will understand why: it is a very forgettable track. The main attraction is the B-side, a beautiful ballad with typical eighties romanticism.